My name is Sam Gant and I’m currently one of the Client Relationship Managers working here in Dakar, Senegal. Today I got to meet with Djiby, an extremely enterprising young man who took time out of his hectic workday in Dakar’s bustling Alize market to meet with me at his home in Parcelles. Djiby has recently expanded the products of his mobile business to include different perfumes, such as Lacoste, Black XS, and Allure, which e buys in bulk at Sandaga market for 1000 CFA per bottle and sells to his customers for a 50% markup. Often clients will request specific products that he will find for them, but following his partnership with Zidisha Djiby is able to do more business by having a wider range of stock on hand. Djiby lives on thin margins, paying an average of 3000 CFA per day on food and transport, in addition to the 25,000 per month he pays for housing– meanwhile, he earns 5000 CFA on the average day. He is very committed to his family, and turns over part of his money to them to help his brother continue his education. He thanks you for your patience and confidence in him, and hopes to apply for another loan once he has repaid this one. Meet Zidisha borrower Djibril Pouye. 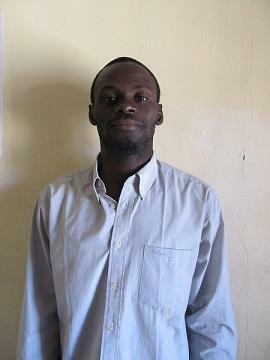 Dijibril is from Dakar, Senegal, and is in the electronics business. He sells everything from mobile telephones to laptops (even iPads!). However, because his stock is costly, he needed some additional capital to purchase stock. That is when the Zidisha lenders gave Djibril a loan that helped him reach his goals! I was able to visit Djibril (Djiby) last week at his electronics business. He and his brother own a small shop located in a bustling indoor electronics market. They sell cell phones, but also secondhand laptops, iPads, and other specialty electronics. With many other vendors surrounding them, Djiby’s business differentiates itself from competition by selling higher-end electronics. Currently, Djiby says the iPhone is their best seller. They are currently paying back their first loan and are eager to finish the payments quickly in order to take out a second, bigger loan to support their growing business.